He was born 4 October 1946 Pruszcz year. Military service began in 1964 Officer Cadet School of the Missile Forces and Artillery in Toruń. In 1967 year promoted to lieutenant of the Polish Army. He served in the 32 Mechanized Regiment and 4 Regiment of Artillery 8 Mechanized Division. 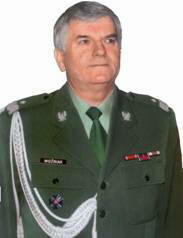 After completing his studies at the Academy of the General Staff in Warsaw (1974) was sent to work on the Board of the General Staff II. Between 1980-1984 deputy military attaché, sea ​​and air transport in London. Since 1987 attache obrony, military, sea ​​and air in Washington, DC. After returning to the country in 1990 was head of the Office of Studies and Analyses Military Information Services, followed by three years (1993-1995) – Director of the Department of Military Foreign Affairs. Lead author of Polish documentary presentation of the "Partnership for Peace". In 1993 appointed to the rank of Brigadier General. From 1 April 1995 do 30 September 1997 year, the extent of Major General (major general), commanded the United Nations Interim Force in Lebanon (UNIFIL) - In the rank of Deputy Secretary-General of the UN - to give the highest rating for professional management of more than 5-thousandths of an international quota, which included separate subdivisions of 12 State. He was the second Polish general in more than 50 year history of the United Nations, Head of Mission, peacekeeping force in charge of the organization. Between 2000 – 2004 attache obrony, military, sea ​​and air in Moscow. A graduate of postgraduate studies: foreign service military General Staff, national security and international relations at the University of Warsaw. Ph.D. in military. As a diplomat, he was invited to give lectures at the Air Force Academy and the Military Academy of Land Forces of the United States. Awarded m.in. Commander's Cross, Officer and Knight of the Order of the Rebirth of Polish, Gold Cross of Merit and numerous foreign awards, including: Commander's Cross of the Republic of Lebanon, Officer's Cross of the Legion of Merit USA, Gold Medal of the Order of the Patriarch of Jerusalem and the Russian Orthodox Church. Between 2004 – 2006 he was Director of the Department of the President the authority over the Armed Forces of the National Security Bureau. 4 October 2006 year, when 42 years of service and reaching the upper limit of the retirement age, he retired. On 3 brand 2007 r. took over as President of the Association of the United Nations Peacekeeping Veterans. Wife Eve, children: Monika, graduate of the University of Warsaw and Peter – SGH. Interests: International Relations, military history, szybownictwo.